The division's biggest news was the serious ankle injury suffered by the Blue Jays' Jose Reyes. 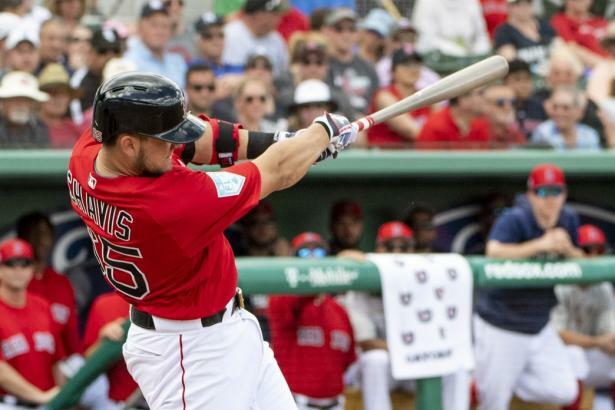 A Red Sox slugger, on the other hand, is getting healthier (we think). Is there anyone threatening to steal time from Pennington or Helton if they don't start hitting? Plus, the Dodgers acquire a backup catcher, and the Padres contemplate Quentin's absence. DIVISIONAL OUTLOOK: NL Central—Will pitching injuries bring prospects? Could pitching injuries in MIL, CIN, and PIT accelerate the timetable for top prospects? Plus a hot Matt Adams in STL and the Cubs' fluid closer situation. DIVISIONAL OUTLOOK: NL East—What's up with Halladay? Because of early season injuries, both the Indians and Twins have shuffled their starting rotations. DIVISIONAL OUTLOOK: AL East—Sabathia slowing down? Already beset by injuries to aging veterans early in the season, the Yankees had starter C.C. Sabathia add to their troubles on Opening Day. Gerardo Parra is getting an extended look in the leadoff spot for Arizona, while the left side of the infield still presents problems for LA. Plus a look at closer candidates in Colorado should Betancourt get dealt, and in San Diego should Street get hurt. DIVISIONAL OUTLOOK: NL Central—Is Hamilton on the horizon?